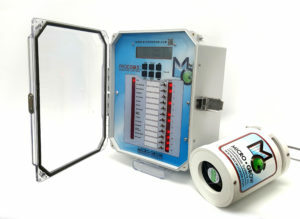 Procom, simply the best environmental computer control choice for professional commercial growers and research greenhouses worldwide. Years of research and development have resulted in the Growmaster Procom being the system choice for hundreds of commercial and research greenhouse growing operations throughout the world. From a single zone of operation, to complex multiple zone applications, the Procom delivers time and time again. The Procom features “state of the art” control algorithms based on internal conditions as well as outdoor weather conditions. Also included are four separate daily operation modes including DIF. Manual override switches are located on the front panel for ease of use. A large informative display constantly updates as to all greenhouse conditions and equipment operations. Enclosed in a NEMA 12, lockable non-metallic enclosure with a clear cover, the Procom is easy to use and easy to install on new and existing projects. Low voltage 24 VAC operation.